Rearranging literal equations is a vital part of Algebra. These worksheets are highly recommended for high-school students. Knowledge of 'inverse operations' and 'properties of equality' is a prerequisite. An array of exercises like two-tier of rearranging equations, rearrange and evaluate the literal equations, word problems in physics and mathematical formulae and more are included. 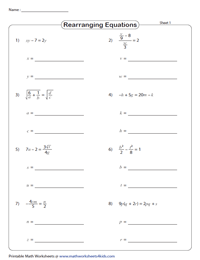 These type 1 worksheets require students to make 'x' as subject in each problem. The worksheets are sorted into three levels based on the complexity of the equation and the number of variables in it. Solve each algebraic equation for the given variable. Use the 'properties of equality' to isolate the subject in each equation. Solve for two unknown variables by rearranging the literal equations in each problem. 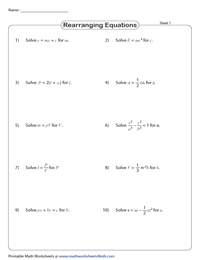 Each worksheet consists of eight equations. 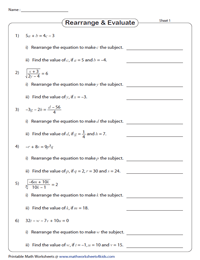 Rearrange the algebraic equations to separate the subject. Evaluate the value of each subject by substituting the known values. 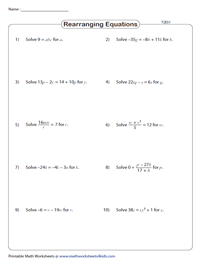 Employ this assortment of literal equation worksheets with captivating ideas that claim to rearrange the physics and mathematical formulae to express the equations for the given variables. 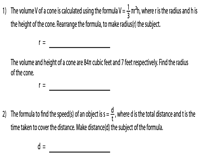 Rearrange the formulae of physics and mathematics disposed in word form. Also, solve the word problems to find the value of the parameters like radius, length, height, mass, volume, work done, Fahrenheit and so on. Available in customary and metric units (members only).